We hope it survives the high rents, at least for longer than other short-lived dining spots on this street, as Locale our new favorite Old Town restaurant. We’ve made several visits already. At first sight it doesn’t look much out of the ordinary. Its pristine, upscale atmosphere shouldn’t put off all but the well-heeled, because the menu is surprisingly affordable. While the white-tablecloth dining room on the secluded second floor serves as a retreat for well-dressed clients, the ground floor seating around and behind the beautiful stone-topped bar is more casual. 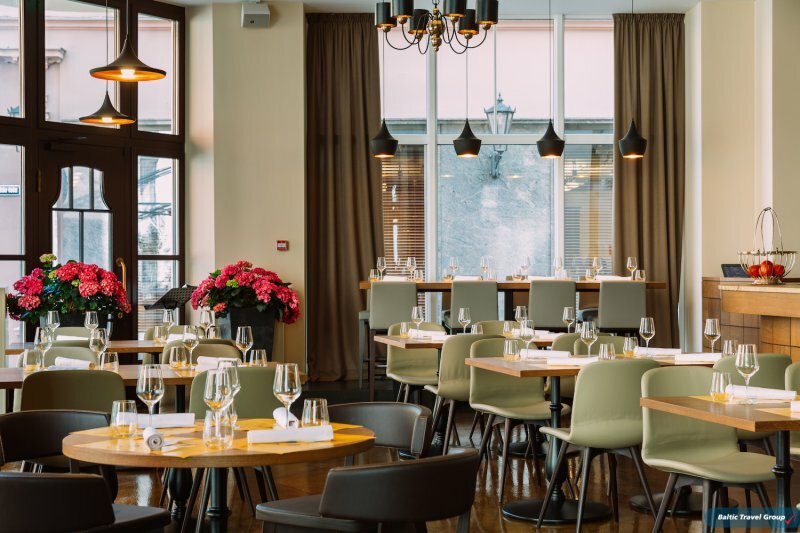 Locale is the first restaurant in the city owned by Ruben Panasyan, a Riga-born businessman of Armenian descent who has owned a spectrum of restaurants and clubs in Moscow and opened the Russian capital’s first cocktail bar. For Locale he’s hired a talented chef from Florence who is continuing to explore the many possibilities of Latvia’s fresh products. 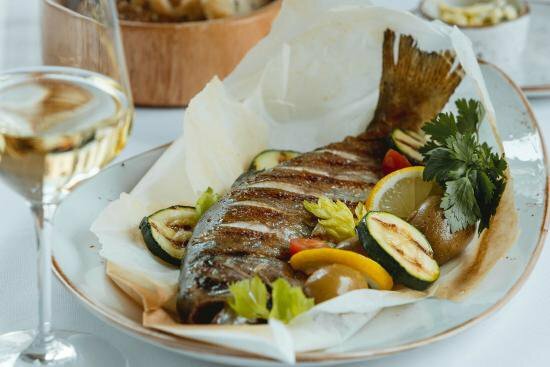 The idea behind the menu is to create Mediterranean dishes with a Latvian twist. After all, fresh Latvian ingredients are at least as good as Italian ones. We love, for example, the bruschetta with pickled herring (€5.50), using black bread, guacamole-like avocado puree, and tiny sardines marinated Mediterranean-style and cooked in lemon, topped with marinated egg yolk. Break the yolk and smother it over the fish before eating. On our most recent visit we ordered a range of dishes. Every one of them was a hit among our small group. We were suggested a bottle of the Reserva Especial Cono Sur pinot noir from Chile, poured into our broad and shapely glasses and tasting voluptuous. We were glad of the suggestion as the wine list was impressively long with, for example, 14 whites from Burgundy alone. Among the treasure of food to be brought to the table: raw and rich-tasting sausage smoked for 48 hours then air-dried for six weeks, and thin slices of Latvian country-style “soft fat” that melts in the mouth and goes perfectly with the homemade breads in the basket. We also had fried squid a la plancha (€7), cooked over a hot plate and tasting smoky with a spectacularly tongue-tingling salsa, and slices of soft-salted Baltic salmon (€4.50). We adored the intriguingly multicolored and delectably light ravioli stuffed with baked beetroot goat cheese in green olive dressing (€11), served with flakes of rich Latvian Parmesan-type cheese on top plus slivers of green beans and olives. And the lamb rack with kohlrabi and olives (€21.70) was heavenly, with the succulent fat left on with roasted potatoes, pungent black olives, cherry tomatoes, coriander leaves and some light gravy. This was lamb as it’s meant to be tasted. A different wine was suggested to go with this dish – a deeper, darker Argentinean Malbec. During the meal we also enjoyed a few of the amazing homemade lemonades (€5 or €10), created with locally made syrups that also go in some of the cocktails and herbal teas. Try the lovely rhubarb lemonade. Among the countless aperitifs are a few not commonly found in Riga, like spritz (€6) and Pisco sour (€5). If you find room for dessert, go for Mascarpone semifreddo (€8.70), with espresso fashioned into sorbet, chocolate pearls and meringues. It’s a light finish to a great meal.